I remember in the 1970’s being eager each month for the latest issue of The Savage Sword of Conan to be on bookseller’s shelf. The black and white art in this over-sized comic book typically was much more impressive than that in the smaller color comics, and a big part of the reason for that was because of Alfredo Alcala. And so, when I saw this book was available (again), I couldn’t resist getting my hands on it. First…this is not a portfolio. This is not just drawing after drawing to ogle over, though there is plenty of art inside, it’s not being reproduced on a frame-able quality. Second…this book is only eighty pages long and more than a quarter of it is taken up with introductions (by Gil Kane and Roy Thomas, at least). Third…”Secrets Teachings” is a bit of a misnomer – there really aren’t any secrets here, but we do get some insight into Alcala and his technique and his thought process as he develops a comic book. And this is what makes the book worth-while. Before his work on Conan, Alcala created and illustrated a series called Voltar (a clear predecessor to Conan), and this book selects one issue of Voltar and Alcala walks the reader through the entire issue, explaining his thought process to the layout of the page and for each panel and even why some things are light, some dark, etc. It was really fascinating to read how much thought goes into this from the artist’s point of view. Because, when I think of Alcala’s work, I think of his incredibly detailed work, I would have liked to have more insight into his actual process of inking. I did appreciate his mentioning how artists need to be able to draw (not just ‘finish’), and how learning about the human body and how it reacts in different poses is important (and he gives an example of when it doesn’t work). Alcala mentions using both pen and brush as tools in his art, and here again I would like to know more. I had always assumed his work (look at the drawing on the cover as pictured above) was purely pen and ink. Where and when would he use a brush? Though I still have questions about his work, I really enjoyed this book, both for the art and for what I learned. I recommend this book very highly for anyone interested in art, not just comic books. Looking for a good book? 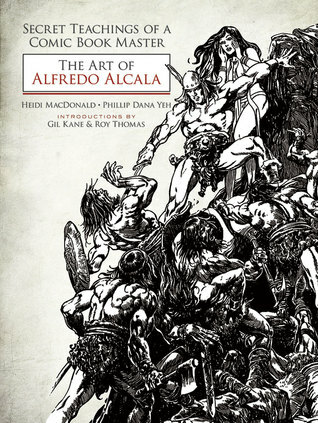 Secret Teachings of a Comic Book Master: The Art of Alfredo Alcala is a wonderful look at the thought process of one of the best artist/inkers in comic book history and should be read, not just by comic book fans but by anyone who appreciates great art.